Few big male grizzlies are still walking around in the mountains. 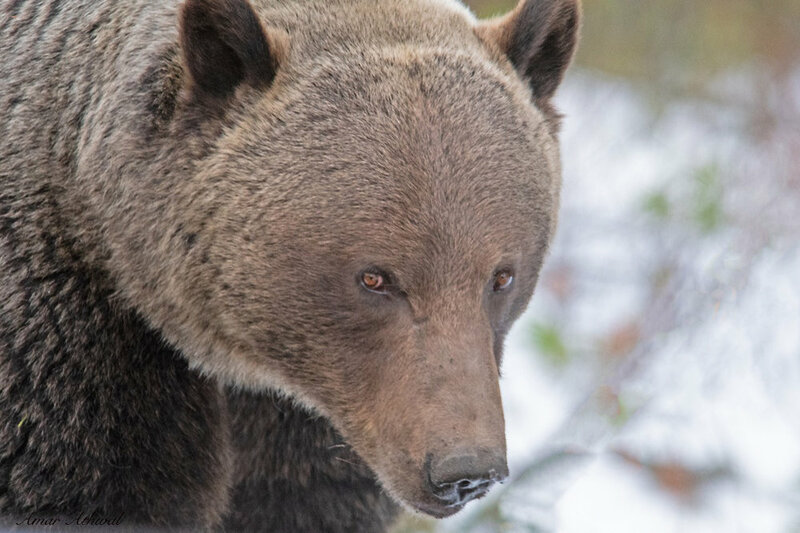 Relatively speaking the warmer temperatures has to be playing a role and if food is out there, the big grizzlies are going to find it and can easily fight other predators for it. When the snow is on the ground, I come across so many snowshoe hare tracks, but rarely see them. A few weeks back, I came across this little one, hiding under low branches. Taking its time changing from its summer colours to the its winter colours. Without its white winter coat, it would be easily spotted by its predators, giving it a short life. Few weeks back when the water was starting to freeze over, open water producing a reflection of the Waputik Mountains. It was a cold morning, the sunrise was not what I was hoping for, so I decided to go for a walk along the river, going in and out of the forest next to it. With each hour it was getting warmer, I could hear the birds every now and then going through the forest. Too high in the trees for pictures. I looked in the distance, something was looking toward me, a male moose. I started to move, it moved, and soon it was out of view. Ten minutes later I was on at a higher elevation, and could see another male moose, it was younger and eating plants from the river's bottom. This moose did not look toward me and soon left. As I was eating and now taking in the warmth from the sun, I could hear not too far from me something was moving to the left of me, first through the snow and then trough the river. The forest I was standing by was blocking my view. Soon after the first moose I saw that day or another moose of the same size was standing across the river, about 110 meters front of me, looking at me. It crossed the river and was still looking at me. I was ready to move away quickly if needed, it was the rut season and the bulls are not too happy around this time. The bull walked past the small trees into the open and was still looking toward me. Still safe distance, I moved out of the trees for the moose to have a good look at me. It stood still and looked at me for a minute and then started walking toward the river to the right of me. That's when I started taking pictures of the male. It did not look back, crossed the river and then faded into the forest. Red Fox traveling along the road one morning, who was stopping every now and then to hunt for breakfast. 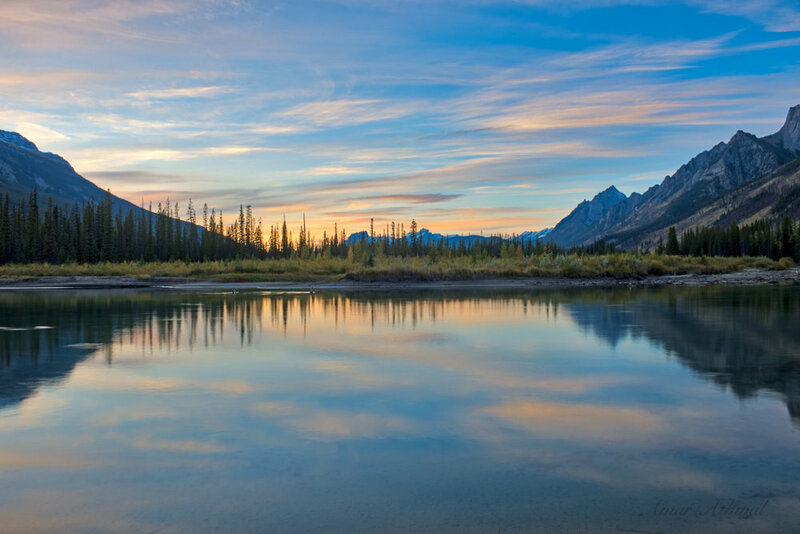 We have been having some wonderful sunrises, I have been watching them along the Bow River and in this case from the Vermilion Lakes. 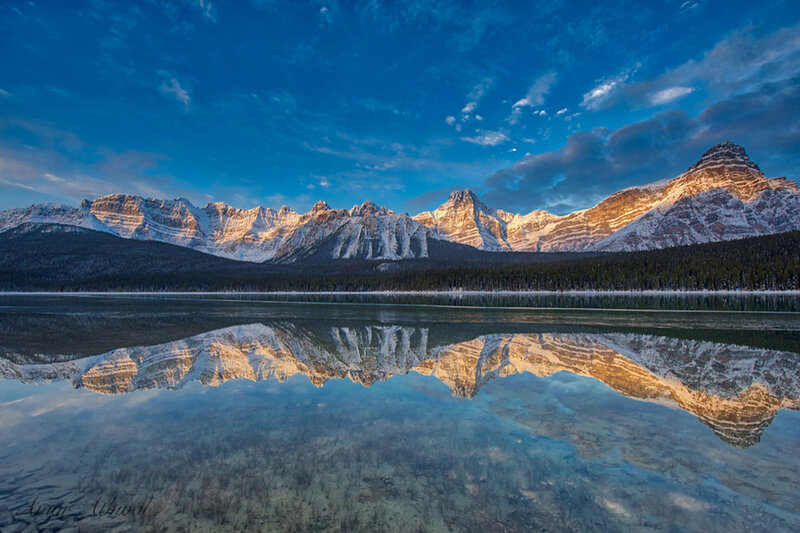 Mount Rundle, one of the most photographed mountains in Banff National Park, centre of this photo. With the mild temperatures, the water is still wide open at the lakes, helping out with the reflection. It was a cool evening and I was waiting in my vehicle for a large grizzly to come out in the open. He was still few hundred meters away and was taking his sweet time. With the window down I could feel the cool breeze every now and then, looking out, listening and wondering if griz was going to come out before the dark. May of 2011 was the first time I saw this male, he was a skinny young male walking along a road in a another national park. Two years later I saw him again, he was filling in nicely in terms of weight and his role in the mountains. In the last few years I have seen him several times, Banff NP is his main home, his range covers at least two more parks that I'm aware of. By chance last year I saw him with at least three females, for one female he covered 60 kms in two days to mate with. This fall from my eyes he looks to be easily over 600 pounds and is making the most of his size on the landscape. My waiting paid, he stayed on route and gave me a minute to see him before he was out of sight again. He should be close his time for deep sleep for the winter, if he isn't already. Hoping to see him again next spring. The rut season is over, the elk are taking advantage of the mild weather to gain weight. Particularly important for the dominant bulls. who lost 20 to 30 percent of their weight battling other bulls. The more weight the bulls gain, easier it will be getting through the winter. The american marten went up the tree when I came across it, a way it protects itself. Once realizing there was no danger, it came down to the ground and ran away. Few weeks back on my way home from a hike I had to stop to watch the sunset and take a picture. Banff makes it so easy to be in the right place at the right time to get the picture. During the fall as other seasons. I try to take pictures of wildlife surrounded by the background of the season that's taking place at that time. I was hoping to come across bears with the fall colours surrounding them, no luck again. But I did have some luck with the birds, it paid off carrying a lens to get close to the birds. I would hike through the larch trees and stopping when a birds were heard. Seeing which direction they were coming from and then wait for them to pass by me. There were always opportunities to get a picture, but not always a good picture. In this case I was hearing several kinglets and chickadees heading in my direction. I guessed where they would pass by as they went from tree to tree looking for food. 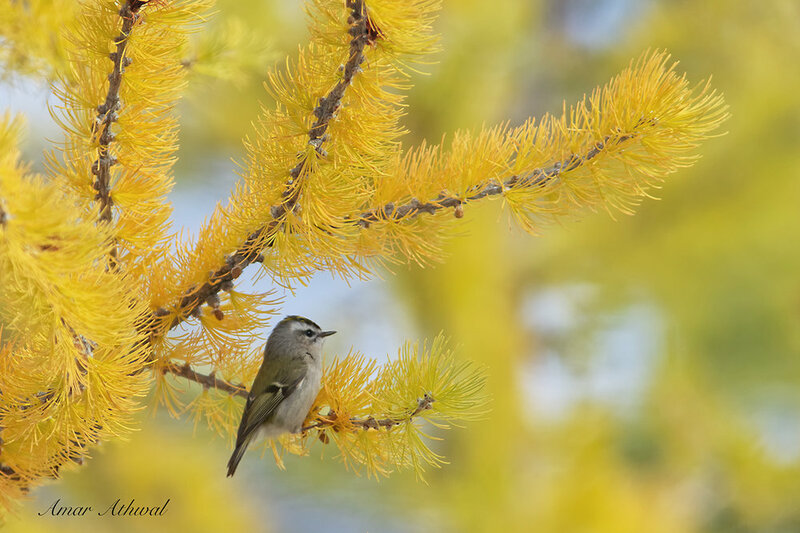 This Golden-crowned Kinglet perched not too far from me, showing a bit of its golden crown, I focused on it and got the picture of it perched on a larch tree branch. Next year I'll have to persuade a kinglet to show me more of its golden crown, matching with the larch needles. 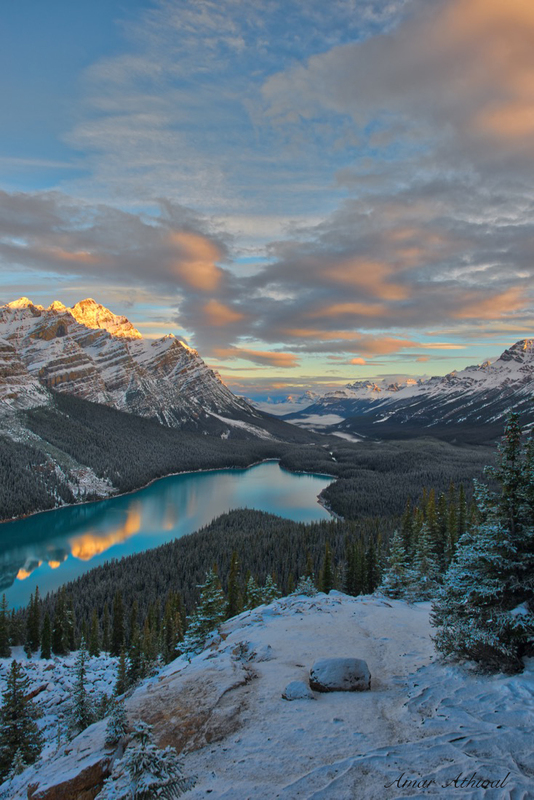 I thought I was going to be late for the morning picture of Peyto Lake. I have not been up there as much as I like to this year, so I was looking forward to spending a small amount of time in the morning. After taking the picture, I explored the area for a while before heading out. The Great Blue Heron came into the area I was in, saw me, made a quick turn right and flew away. A few weeks back it was an overcast morning and it was going to stay that way for the duration of the day. With minus five degree the hike started about half an hour after the sun rising behind the clouds. Much of the hike to Rockbound Lake is in the mostly evergreen forest, slowly the sounds of the vehicles from the road and highway disappear. Any wildlife encounter was mainly in the form of small birds and the only mammal spotted was a red squirrel. When the train started to even off, the reason why I was on the hike became visible, larch trees in their beautiful fall colours. The numbers increased as I got near Tower Lake and becoming the dominant tree upon reaching Rockbound Lake. I probably ended up spending more time exploring the lake than it took me to reach it. Taking pictures from various locations as a Common Loon and a Raven watched me. This picture described what the morning looked like that day by the lake, various shades of grey with the golden larches. 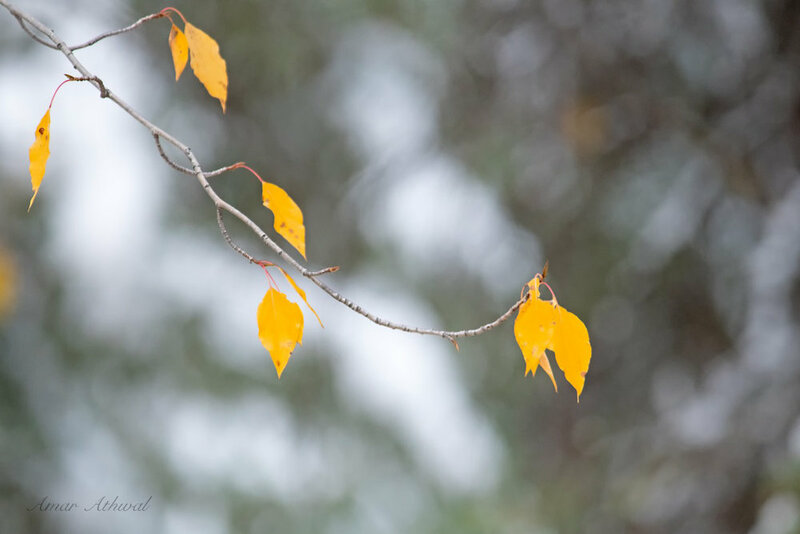 Still few leaves cling on, time is moving fast before they also join the leaves who have ended on the ground. On my way back from a great outing, where I was exploring and taking pictures, I came across this large grizzly walking near the road. In his full fall weight, all ready to go into a deep sleep to pass the winter. Every now and then he would stop to dig for some calories and then continue his merry way. Standing next to the Bow River, watching the end of the day as the sun sets behind the mountains. Moose like other wildlife have been dealing with more snow and cooler temperatures much earlier this year. Even with warmer days coming up tomorrow, much of their food has fallen to the ground. The moose will start eating twigs sooner then later. The decibel level of elk bugling is 90 dB at 4 meters, lawnmower and food blender are two items that have similar sound levels. I have heard the bugling as far as 1 km away, with elk's larger ears, they would be able to hear the bugling from even further distance. this is important for the females who want to mate with a stronger male and help keeps weaker males away. Over 85 dB can lead to damage for human ears, another reason for us humans to keep our distance from wildlife. The recommend safe distance from elk i at least 30 meters. at that distance the bugling sound level comes to 72.5 dB. Close to the sound level when you're using a vacuum. Even on their own, each larch tree needle looks beautiful in their fall colours.